The email tool automatically checks you RSS feed URL to ensure it's formatted properly. If you see an error message after adding your RSS feed URL, troubleshoot the feed using the resources below. 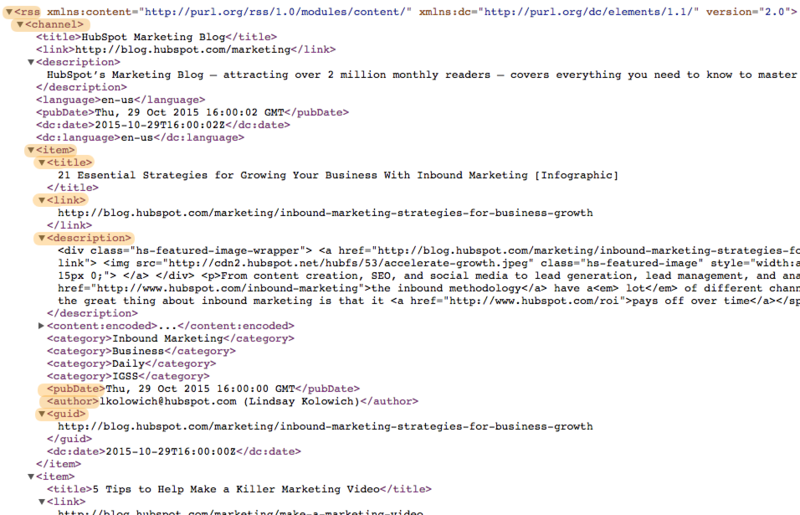 HubSpot RSS emails require a feed that is W3C valid. You can check the syntax of your RSS feed URL using the validator on the W3C website. After you confirm your feed is valid, be sure that there is a unique Guid for each post entry item to avoid the risk of duplicate sends. If your see a warning in your HubSpot email editor about Missing fields, be sure that the feed is formatted and nested properly as illustrated in the example below. The Title and Link fields are required for the feed to be treated as valid. The list below provides an example of valid formatting for each field. Depending on the format of the feed, each field (e.g., summary, link, title, published, and author) can originate from different nodes of the xml. Please note: if you can't identify the problem using the resources above and continue to experience issues with sending the RSS email, start a discussion on the Community or contact Support. Complete your email, and send it when ready.